Skolkovo has five clusters: information technology, space, energy, biomedical and nuclear. Appell reports the incubator enjoyed some early successes, fostering the development of a number of successful companies. One of them is Dauria Aerospace, a developer of low-cost satellites. However, both Skolkovo and its prime backer, Medvedev, have faded in recent years. This has been especially true since Putin was re-elected to his third term as president in March 2012, and Medvedev slid back into Putin’s former job as prime minister. The decline of Skolkovo and Medvedev’s broader agenda has a number of causes. A key one involves vision. Medvedev understood Silicon Valley-style technology innovation requires fundamentals such as the rule of law, patent enforcement, the open exchange of idea, and basic democratic freedoms. His view of Russia’s future is decidedly western in outlook. The approach is antithetical to Putin, who since taking back the presidency has cracked down on political and Internet freedoms. Putin’s instincts run toward the centralization of political and economic power in the Kremlin, with the elites dependent upon him and the political opposition weak and divided. That’s the vision that dominates in Moscow today. Appell believes Medvedev’s effort on Skolkovo was genuine, but that his implementation of it played in Putin’s hands. Putin’s annexation of Crimea and support for rebels in eastern Ukraine brought on Western sanctions that hit the Russian economy hard. The fall in oil and gas prices has deepened the economic recession, proving the wisdom of Medvedev’s effort to diversify the economy while leaving the government with very little money to invest in the effort. Meanwhile, investment from outside the country has begun to dry up while Russian high-tech companies are fleeing abroad in droves. All of this brings us to the struggling Russian space program, which has experienced a long list of launch failures in last six years. The crisis in the program was long in coming, beginning with a collapse in spending that began in the post-Soviet era and discouraged a generation of youth to avoid working in the field. Today, everything about the Russian space program seems worn out: the people, facilities, technology and strategic thinking all seem to hail for an earlier era. Waste, fraud and abuse is endemic in the bloated, inefficient sector. Since the crisis began in late 2010, the Russian space agency Roscomos has been led by a series of general directors, none of whom were able to right the listing ship. Launch failures have continued unabated; Russia suffered two more just in the last three weeks. Putin appointed Deputy Prime Minister Dmitry Rogozin to oversee the space program and the larger military-industrial complex of which it is a key part. It’s not clear whether the colorful, bombastic politician — who has made headlines by threatening to tear off the heads of people obstructing his efforts — has actually improved anything or simply kept the situation from getting worse. Given the continued launch failures, it would not be surprising if Putin’s patience with his space czar is wearing thin. With everything else having failed, the Russian government has decided to consolidate the entire space industry under the state-run Roscosmos. Re-nationalization wasn’t the only option available, but it was probably the only one that was palatable to Putin and his brain trust given their need for control and rejection of Medvedev’s economic and political vision. Alexander Golts, deputy editor of the online newspaper Yezhednevny Zhurnal, doesn’t think this effort will do anything to solve the space industry’s many underlying problems. The problem is that the Russian authorities have only one response to these challenges — bureaucratic maneuvering. According to that logic, if the industry is facing a systemic crisis, a new director is required. That is why the Kremlin has replaced one space industry head after another, drawing on officials from the military-space forces responsible for missile launches. They brought in space industry outsider Igor Komarov, former director of the AvtoVAZ automobile plant. However, that did not produce any discernible improvements. Finally, the authorities pulled the most powerful card from their well-worn deck of bureaucratic solutions and launched a large-scale reorganization. The result will merge the United Rocket and Space Corporation — that includes space industry manufacturers — with Roscosmos. That will unite the state contractor with the agency placing the orders, essentially ruling out any possibility of external control. The customer will always claim that the manufacturer produced exactly what was required, and both will blame all breakdowns, accidents and disasters on insufficient government funding. At the same time, state officials should rein in their appetites and concentrate on a few priority projects rather than attempt to produce a full range of weapons. Of course, that remains only a remote possibility as long as Deputy Prime Minister Dmitry Rogozin and Defense Ministry brass continue to insist that the military-industrial complex serve as the main engine of growth for the Russian economy. So, the overall picture doesn’t look very good. Efforts to diversify the Russian economy into high technology are floundering. Putin’s policies and the crashing economy are driving entrepreneurs and their companies abroad. Rogozin’s efforts to reform the military-industrial complex don’t appear to be effective. And the space industry is being consolidated into one big, inefficient government bureaucracy. 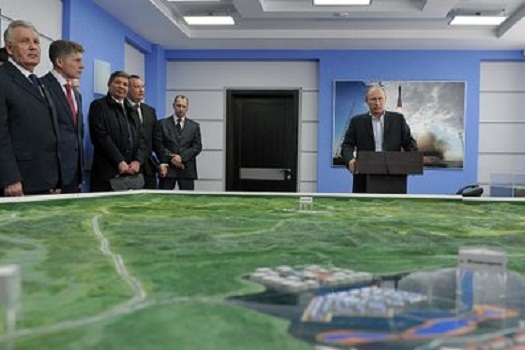 The situation does not seem to bode well for the future of Russia and its space program. While Russia consolidates and centralizes, the American space program is in the midst of a commercial renaissance marked by innovation and creativity. The center of gravity in the United States has shifted away from government and its traditional contractors to new companies and locations. It’s not clear how Roscosmos will be able to compete in the future. The Russian space program could continue to decline, no matter how many rubles the government spends or how many heads Rogozin threatens to rip off peoples’ bodies. Great article Doug. Helped layout context very concisely for someone that does not follow Russian efforts very closely. Sadly, the west, esp. America, needs to learn a lesson from this. I am hoping that Russia comes around and they join us in going to the moon. Making what you want with other people’s money without their consent, is the DEFINITION of corruption! Government is defined the same way. Government can never recreate a Silicon Valley, it is namely what government is not: People risking and controlling their own money and who therefore take care of achieving some results. Angara and the new kosmodrom will certainly be suboptimal and won’t be able to compete globally (in design/manufacturing and hence won’t be economical/reliable) because of Putin’s national isolation principle, the idea of making all of it at home. And what would they launch to anyway without the ISS?The 3rd big thing Russia is doing in space during the next few years, is the ESA-collaboration over the ExoMars rover. To be launched in 2018 separately from the ESA TraceGas orbiter in 2016 (both on Proton, likely with the same problematic third stage). Soviet/Russia has failed 5 out of 5 attempts to soft-land anything on Mars, not counting the 3 failed missions to Phobos landing, adding up to the humiliating 8/8 failure ratio during the half century of attempts 1962-2011. Moon and Venus are the only objects the Soviets soft-landed anything on. 31 and 38 years respectively have gone by since the last successful interplanetary and lunar mission respectively. That alone makes the continuity of competence questionable. What do you think they could contribute with? With all of the alleged foreign hacking coming out of Russia, one would think that they would be able to get their own software operating properly. Looks like now is the PERFECT time if a company wants to get into the commercial launch market for both satellites and manned spacecraft. I wonder if this will benefit anyone we know of??? I am sure they would join just us if we paid most of the bill as with ISS, just as the Europeans would. Warm fuzzy statements about exploring the Moon together with our international “partners” in space. They see what the future in Russia will be under Mr. Putin and don’t like what they see. And its not just business professionals. It might be a good time for U.S. rocket propulsion firms to see about picking some good engineers and scientists. “The number of Russians successfully applying for the U.S. green card lottery nearly doubled from 2013 to 2014.” — Anyone here realizes that this number is a lever regulated but the U.S. Department of State? We can — and did — increase it 2x or 3x by a few computer keystrokes. yeah. I think that we have paid MORE than enough for ISS for both Europe and Russia. Or, they can join in on private companies and expand their own systems slowly. Seriously I’m not sure they can contribute much in terms of hardware, their price is no longer cheap when comparing to SpaceX, and any new development will need outside financial aid. They do now, and the world is depending on it, but that is building on a legacy which is not being revigorated. They sell crewed launches because the US is the only alternative and US space policy has been so gravely mismanaged. They sell launches of billion dollar sat’s like MexSat using the 50 year old Proton because the US military industrial complex has been as corrupt as the Russian counterpart when it comes to launcher development. That won’t work in an age of private space. The point is that they don’t INTEND to cooperate, Putin wants to do it at home. That’s why they build that new kosmodrom, which is said to be unsuitable for crewed launches because the forest to the east of it presents a hazard for a launch abort landing. If Russia did integrate its space competence and assets in the world trade economy of specialization, they would have successful niches, like ESA, JAXA, ISRO. But that is not the official plan and that’s why they will deteriorate. Today, international cooperation is what is keeping the Russian space program going (ISS, Guyana-launches, ExoMars). Without it there’s only their military left to serve and they are only interested in LEO robots, nothing beyond and no humans in space. I find myself in disagreement with you more often than not but here I think you are 100% spot on. At is least; Russia does not try to turn the world to its “best”. Let the Russians do their thing and go their way. It might be possible that some business chances for some of us will arise. I would move to Russia if I would be somewhat younger and a farmer or a craftsman for example! Many, many opportunities there, which do not more exist in central European societies. Yes, but by our nixing it, it forced their money towards military and China. Far better to encourage their spending on things that will help their nation and help bring more peace. The ExoMars mission (launching on Proton) patch needs to include a four-leaf clover, one which SpaceX looks ready to retire. Just move there and get it over with. And please give up your western citizenship. As to skills, you have claimed that you have worked on rockets before. If so, than Russia needs you. situation as entrepreneur, not as employee. Your personal attack against me is really lousy. farmers, which founded their own business in Russia and are very successful now businesses and have many employees. Russia has a large need to advance their own food production, which is a chance also for entrepreneurs (good farmers) or existing company to build a business there. Our branch (space) is a much more difficult topic for such venture (also in respect to required investment), but it is also not impossible. Let see what I can accomplish here in future. It was not a personal attack. You have it such that Putin can do no wrong , while west, esp. America, can do no right. You said that you have skills , yet have stated that you have worked on rocket engines before. As such, you have the skills that they need and should go there. Now, show me where I am anti-russian, or have attacked you. There was nothing in this that was an attack, but it was brisk due to limited time. And as to my opinion of Russia, I continue to hope that they will continue working with west, rather than attacking sovergn nations and backing China. The US could launch its crew from US soil if it wanted to ASAP. Unfortunately Congress has decided that funding Space Launch System is more important. Even though Space Launch system wont carry crew in Orion until 2021 and after that its unclear when if ever we’ll use the 450 million per launch launcher. You know, because SLS wont send humans anywhere except maybe a trip around the moon without an increase to NASA’s budget in the next 30 years. Which frankly is unlikely, because NASA’s budget has been decreasing for the past 40 years and that’s unlikely to change.